We all know the traditional narrative in International Relations of the state as a unitary act. Despite substantial volumes of work in the foreign policy analysis subdiscipline as well as in IR theory, the common shorthand in IR scholarship is to say ‘China’ did X or ‘Britain’ bombed Y. At least in the case of the United States, climate change is going to force scholars and analysts to seriously reconsider those assumptions. In the wake of the Trump Administration’s (misguided) withdrawal of the United States from the Paris Agreement, a number of subnational actors have come forward pledging—in the international context—to act in contravention to the newly established US foreign policy toward climate change. Twelve states (plus Puerto Rico), representing more than a third of US national GDP, have signed on to the United States Climate Alliance with the express goal of pursuing substantial emissions reductions in line with US commitments under the Paris Agreement. Hundreds of mayors and leaders in higher education and business have signed an “Open letter to the international community and parties to the Paris Agreement” vowing to stay committed to the international climate change policy agenda. 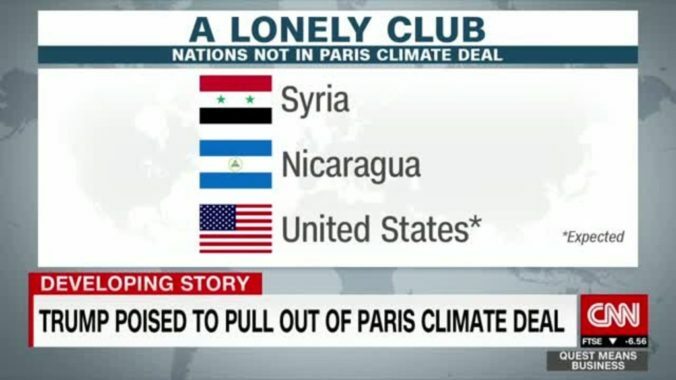 In short, subnational actors of all forms are openly and actively working to subvert the Trump Administration’s climate policy not just domestically, but internationally. It is clear, then, that the current US foreign policy on climate change is not really the ‘US’ policy, but rather the policy of the Trump Administration and a subset of domestic actors who support it. Of course, this rump foreign policy is not entirely novel. Scholars of globalization have for years argued that the increasing interconnection of substate actors across state lines is fragmenting state power and, as a result, foreign policies. But the degree to which subnational actors in the United States are seeking to challenge the Trump Administration’s foreign policy internationally is striking. And the issue area is something quite different than traditional fare in discussions of globalization. The underlying physical and economic processes that drive Climate change are foundational to the modern political economy. When subnational actors seek to challenge the Trump Administration’s climate foreign policy, they are doing so in one of the most significant ways possible. All of which assumes the ‘consensus’ is an accurate report. It does not seem to occur to warmist proponents that the amount of opposition to energy taxation as a global target makes it a globalist political initiative rather than an overwhelmingly accepted ‘fact.’ You cannot have such strong opposition consistent with a consensus which is anything more than a farce. Nor does ignoring scientific disagreement such as the 10’s of thousands of scientists individually objecting to ‘climate science’ as speculative fiction mean that colleges of scientists have been a reliable arbiter of unprovable hypothesis. There is not nor will there be data from the future to certify any opinion as reliable.